Today’s special. Want to know why? It’s Wikipedia Day – that’s why! It has now been 14 years since Wikipedia transformed how we consume information, becoming an online encyclopedia of (almost) all knowledge. So how did we use that knowledge source over the past year? Did we comb its contents looking for enlightenment? Or did we simply use it as a search platform for the superfluous and supercilious? Lets use Business Intelligence and data visualization to find out. Wikipedia has 35 million different articles on every topic imaginable. And yet, in a poor reflection on us and the state of humanity itself, the most popular page in 2014 was “Online Shopping”. This trend continued, with a large number of searches for IT-related topics, including: “Java”, “Facebook” and “Amazon.com” – all of which were in the top 10 most visited Wikipedia pages of 2014, with over 19 million views each! 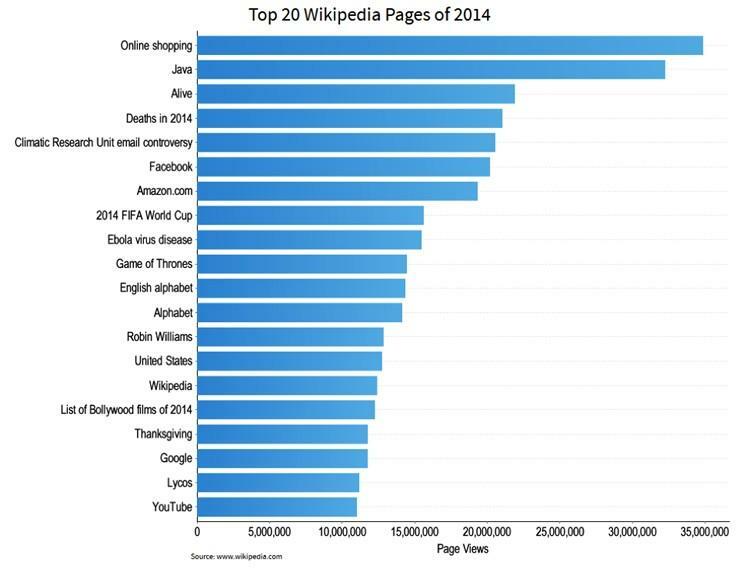 It’s also pertinent to note that the third most visited Wikipedia page is entitled “alive”, while the fourth most is “deaths in 2014”. Is this a coincidence, or does this result actually reflect our insatiable, if not morbid, interest in the human condition – mortality, and what being alive really means? Regardless of the implications, we now know what was on our collective mind during 2014. But, have our interests changed over time? 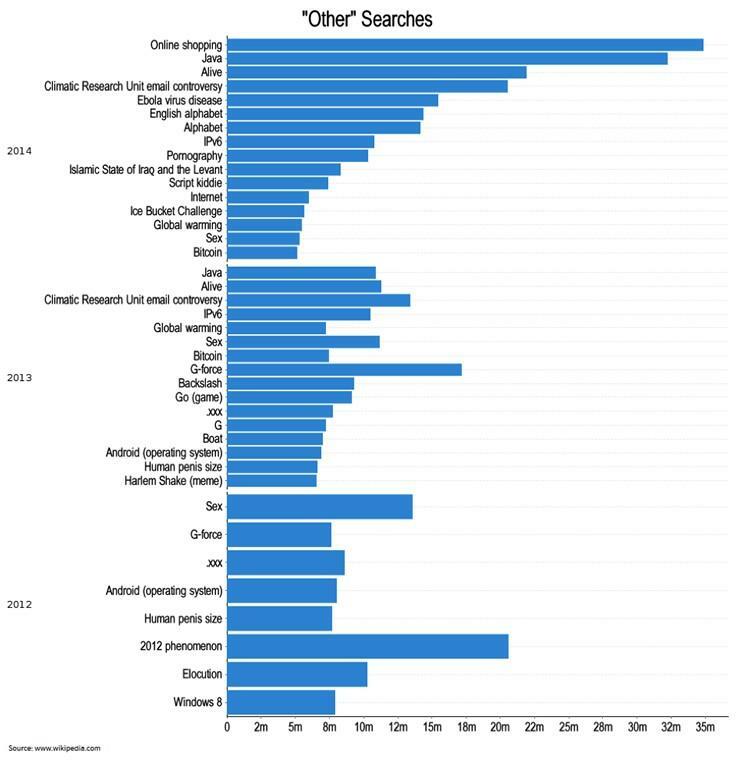 By analyzing the top 100 Wikipedia pages, by category over the last three years (2012 – 2014), we were able to uncover search trends and reveal the topics that fascinated us most. Furthermore, it’s interesting to note the relationship between the number of pages by category, and the number of page views by category, within the 100 most popular Wikipedia pages. For example, while the number of ‘Entertainment’ based pages has increased from 2012 to 2014, the total number of page views within the ‘Entertainment’ category has decreased in a chronological fashion over that same period of time. What could be the basis of this inverse relationship? Could it be that, while our entertainment options continue to expand (hence the growth in the number pages dedicated to the ‘Entertainment’ category within the 100 most popular Wikipedia pages), the unremitting rise of YouTube as a music-based search engine has resulted in a drop in entertainment-related page views? After all, who wants to read about great music performances when you can hear and watch them!? 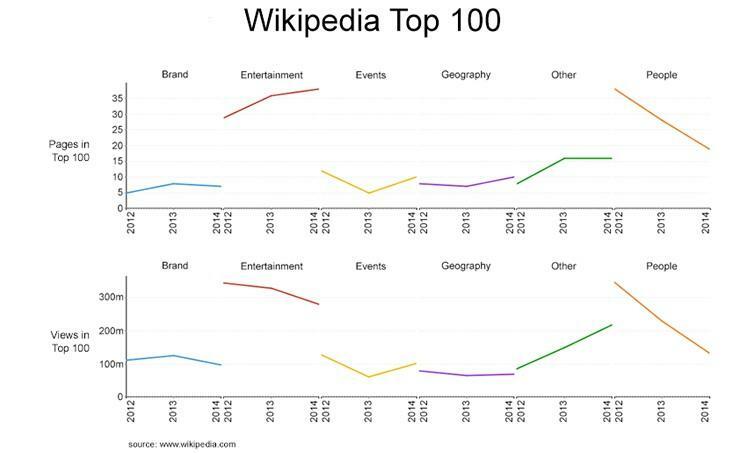 Conversely, the number of pages and number of page views within the 100 most popular Wikipedia pages for the categories ‘Brands’, ‘Events’ and ‘People’ have all experienced proportional fluctuations from 2012 to 2014. In this instance, the most intriguing insight is that it appears that we’re becoming progressively less interested in reading about other people. Both the number of pages dedicated to, and number of page views related to, the ‘People’ category has dropped sharply over the past three years. Simultaneously, we became much more engrossed with ‘Other’ topics. Does this trend, away from interest in ‘People’, combined with an increase in the comparative popularity of ‘Other’ and technology related searches, mean that we’re beginning to place more importance on material things rather than each other? And, what ‘Other’ things have grasped our recent attention, and how have they changed from 2012 to 2014? Maybe this does indeed point to a lonely, androgynous world where we love material objects and technology more than each other.